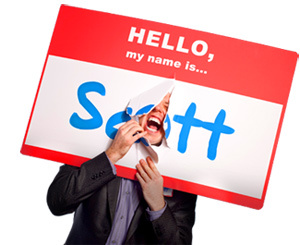 101 Ways to Create a Powerful Web Presence - HELLO, my name is Scott! 1. Blog every single day. 2. Comment on other people’s blogs, especially when they link to your blog. 3. Post at least three videos on YouTube. Make them fun, cool, and most importantly – let the videos show you doing what you do. No more than three minutes each. 4. Post pictures on Flickr of you being yourself, working with clients, doing things you love, and most importantly – doing what you do. 5. Publish at least one article a month on public databases like www.ezinearticles.com. They get AWESOME Google rankings for ya. 6. Write and give away at least one free ebook a year. 7. Any time someone asks to reprint one of your articles, SAY YES! 8. Any time someone wants to interview you for her podcast, blog or newsletter, SAY YES! 9. Post your tour, schedule or travel calendar on your website. 10. Blog every single day. 11. Make use of social networking sites like MySpace, Facebook and LinkedIn. Just try not to get addicted. Accept friend requests from everyone. 12. Create a lens on Squidoo. 13. Publish a regular ezine. Share 1/2 of the main article in the body of your email letter and then publish the rest of it online to drive traffic. 14. Google your name, company name and tagline every week. It’s a great motivator to boost your web presence, especially if the only thing that comes up is your high school golf team score. 15. Publish your profile on ZoomInfo. 16. Post pictures of your customers using your products. Great testimonial. 17. Post videos of your customers using and talking about your products. Even better testimonial. 18. Don’t have (just) a website. Have several. Create an interconnected network of various sites that all point to your MAIN site. Think octopus, not earthworm. And think destination, not website. 20. Blog every single day. 21. If you’re an author, make ebook versions of your books available for download. I say give ‘em away for free. 22. Include a Media Room on your website. This builds your credibility and expertise. Which will attract other media outlets to seek you out. Which will lead to more interviews. Which will lead to more hits on Google whenever someone types in your name or your area of expertise. 23. Interview other people and post the transcripts or audio files online. They’ll take ownership of the piece and tell everyone they know to come to your site. 24. Start an online TV network. 26. Give more speeches. Even if they’re free. See, what happens is, the organization you speak for will include your name and bio on their website. They’ll also post the conference agenda as a PDF online, which will come up as a hit on Google when people type in your name or area of expertise. Sweet. 27. Figure out what everyone else in your industry is doing and then do the opposite. 28. Post lots of lists. 29. Blog every single day. 31. Capture emails and build your list. Create a permission asset. Emails are GOLD. 32. Register misspellings, permutations and variations of your main URL and redirect them to your homepage. 33. I don’t know much about Search Engine Optimization, Google Ad words and Pay-Per-Click, but I hear that stuff works pretty well. Something to think about. 34. Got a book? Cool. Get it on Google Book Search. 36. Review books on Amazon.com. 37. Do surveys on your website and publish the results. 40. Then post them on your blog. 42. Google the names of the leaders in your industry. Evaluate their search results. Check out their web presence and see what they’re doing right. Then copy them. 43. If possible, get on CNN. That really helped me. 45. FACE IT: you’re not giving away enough free stuff. Give more. The more you give away for free, the wealthier you will be. More on that theory here. 46. Share link love FIRST. People will be happy to reciprocate. 47. Send blog posts to people who would appreciate them. BUT, don’t ask them to blog about you. Just deliver value. Reach out to someone new. I did this once and the guy ended up blogging about me, which led to about 1 million hits in five days. 48. Learn about Digg and get dug. Unbelievably powerful. 49. Every time you meet someone who says, ‘Yeah, I’ve heard of you!’ or ‘Oh, I’ve been to your site before,’ write it down. Keep a Word of Mouth Journal. Notice patterns and soon you will hit a critical mass. 50. Dude: just be everywhere! 51. Leverage your expertise in every possible way. 52. Tell your story and make sure other people are telling it too. 53. Don’t cheap out on your website. It’s worth it. 54. Every time someone comes to your website, make sure they know THE ONE THING YOU WANT THEM TO DO, right away. 55. Blog every single day. 56. Blog every single day. 57. Blog every single day. 58. Blog every single day. 59. Blog every single day. 60. Blog every single day. 61. Blog every single day. 62. Blog every single day. 63. Blog every single day. 64. Blog every single day. 65. Blog every single day. 66. Blog every single day. 67. Blog every single day. 68. Blog every single day. 69. Blog every single day. 70. Blog every single day. 71. Blog every single day. 72. Blog every single day. 74. Install Google Analytics. Figure out where people are coming from. 75. Post in forums. Write intelligent, value-added responses. And have a cool signature. 76. Blog every single day. 77. Personally, I think press releases are WORTHLESS. However, many people have had great success with PR Web and other press release websites. Something to thing about. 78. Have some kind of lead-capturing device. 79. Submit your RSS feeds to Feed Burner. 80. Buy lots of domains and redirect them to your main site until you find another use for them. 81. Connect with other like-minded professionals who are ALSO creating a web presence. Have virtual lunches, regular email conversations and listserve discussions to brainstorm ideas and keep each other accountable. 82. SIX WORDS: Send This Site to a Friend! 83. Google the phrase ‘creating a web presence.’ Read up. 84. 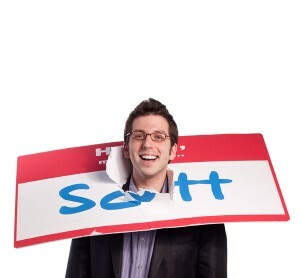 Email scott@hellomynameisscott.com and ask me what the biggest marketing mistake made by entrepreneurs is. I’m happy to share it with you. 85. Figure out your Noticeable Number. Quantify the most remarkable aspect about your business and put a counter on your page that encourages word of mouth and revisitability. (Think McDonalds’ Billion Hamburger Counter). 88. Speaking of writing: blog every single day. 89. And use Technorati to promote your blog. 90. Also, think about getting Meebo Messenger. Coolest thing on the Internet. 91. Contribute to entries on Wikipedia. 92. Start your own group on Facebook. 94. Read Seth Godin’s blog. Do what he says. 95. Read Top Peters’ blog. Do what he says. 96. Read Bob Baker’s blog. Do what he says. 97. Evaluate your website’s hit and unique user ratio. Set a goal to double it within 12 months. 98. Evaluate your present newsletter, RSS feed or other type of subscriber number. Set a goal to double it within 12 months. 99. Just google ‘Gitomer.’ Now THAT’S a web presence! 100. Read the book Naked Conversations. Totally awesome.